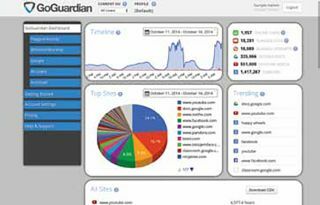 GoGuardian is a full-service Chromebook management solution that combines Web filtering, usage tracking, and theft-management in one dashboard. Realtime monitoring, coupled with Internet, app, and extension filtering and anti-theft features, allows administrators and teachers to track usage of Chromebook anywhere at anytime. Quality and Effectiveness: GoGuardian is a powerful Chromebook management tool with three purposeful uses: content filtering, usage monitoring, and theft management. The monitoring capabilities of GoGuardian allow schools to see how Chromebook devices are being used at both the macro and micro level. This includes the ability to track peak usage times, browse a timeline of activity, view top visited sites by Organizational Units (OU s), and see when students attempt to visit blocked Web sites or inappropriate content. Content filtering allows schools to determine what to block and when. The anti-theft features of GoGuardian are unique, with the ability to log keystrokes, take screenshots and Web cam photos, and geolocate devices. Ease of Use: GoGuardian is installed to the Google Console in minutes using easy, step-by-step instructions. Once installed, GoGuardian begins collecting information from your school’s Chromebook users into a simple, straightforward dashboard. There is a growing collection of documentation in the Help and Support area, and subscribers are provided with a real person and phone number to call for help. Creative Use of Technology: GoGuardian’s software allows schools to filter Web content in a number of ways. There are standard blacklist categories for filtering that are updated daily, which users can choose to apply to individual OU s. Schools can also import their own blacklists, and they can choose to whitelist anything they wish to allow. Web sites on the blacklist are blocked for users, Web sites that are not on the blacklist, but with questionable content, are flagged for review. The flagging feature looks at the content of the site, as well as the metatags, to identify potential problem content. Users can download a CSV file of flagged content (or all data) for offline review. GoGuardian also allows schools to blacklist all Web sites, and then build a list of Web sites they wish to allow students to visit. GoGuardian also allows schools to see which apps and extensions are being installed and used, and it also allows users to add those items to blacklists if appropriate. GoGuardian has also developed a YouTube filter, so that schools can maintain control over the types of YouTube videos users are able to view. GoGuardian allows multiple types of users to see data in the console. For example, administrators can have full control, teachers can have control over their own students, and view-only users are allowed to see data, but cannot make changes. Each user can also receive notification of flagged activity via email and choose the level of flag for which alerts are sent. Schools can choose to monitor and filter all of the time, by specific IP address, or during specific times of the day. When you purchase GoGuardian licenses for your Chromebooks, you are granted the ability to monitor and filter all users in your OU . If groups of users are granted different access levels, the user profile determines what is available, not the device they are using. • Flexibility: Schools decide what to filter and flag, when to do it, and by which means each school can design its unique solution. • Power: GoGuardian is powerful in its ability to filter, flag, and monitor Chromebook usage. • Anti-Theft: The anti-theft features of GoGuardian help protect the school’s investment in its Chromebooks. OVERALL RATING: GoGuardian has done a great job of condensing so many tools and features into a simple-to-navigate dashboard. The ability to monitor, filter, and recover lost or stolen Chromebooks is essential as schools invest in this technology.